Jerusalem, Israel - Jan. 13, 2016 - Thousands of young people from seven countries gathered in the Jerusalem International Conference Center for Taglit-Birthright Mega Event on Tuesday night. After ten days of touring and experiencing Israel, these huge end of Brithright trip events are loud and full of energy. Musical presentations were featured and several dignitaries and Knesset Members attended. Birthright founders and funders, Michael Steinhardt and Lynn Shusterman spoke briefly. As usual, Prime Minister Benjamin Netanyahu spoke to the adoring crowd. "To all of you, the members of Knesset who are here; and of course to Michael Steinhardt and Judy and Lynn – real visionaries; and all the other friends and supporters of Taglit-Birthright, those abroad, those in Israel; Meir Shamir, Gidi, the whole team who make Taglit possible. I want to say bruchim habi'im l'Yerushalayim, welcome to Jerusalem. I'm really thrilled and moved to be with all of you, 3,000 who are here for the Mega Event. You are all mega for me. Taglit is the largest educational project of tourism on the planet and you've come here from all corners of the earth: from Argentina, from Brazil, from Canada, from Russia, from Uruguay, from the United States and from Israel. You're joining over half a million young people from 66 countries who've already experienced Taglit because now you're discovering something very simple: This land if your birthright. And I think you've already gotten a taste of what Israel has to offer – an unparalleled sense of our common past, an inspiring glimpse into our common future. This is called the Promised Land. It's a promised land; it's a land of promise, a people of exceptional warmth and hospitality. And now that you've had this opportunity to see Israel for yourselves – its beauty, its energy, its dynamism, its diversity – I think you can each feel in your own hearts the exceptional bond that connects us all to one another. This is the greatest thing that Taglit does. It's a discovery. It's a personal and collective odyssey for all of you. And I want you to treasure what you got here. I want you to keep this sense of our commonality because we have a responsibility for the future of the Jewish state and the Jewish people. You're young; you're going to continue to be young for a while. And as you grow, remember that it's your responsibility to assure the future of the Jewish people. So I want you to keep what you've learned here in Israel deep in your hearts, but I want you to share it with other people, to share it with your friends, with your communities, and I want you to enjoy your stay. I want you to come back soon. I want all of you to know that you have a home in Israel. This is your birthright. Come back again. Thank you, thank you all. See you next year or the year after that and the year after that. Thank you." The applause for Israel and the Israel Defense Forces was heartening to experience.The "I am that Jew' theme this year seemed very appropriate. Participants had an opportunity to learn about follow up programs, to study and to volunteer in Israel before the main program started in the large ICC auditorium. 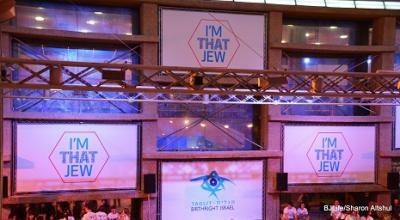 For many their first trip to Israel, is an awakening to their Jewish identity.